There’s not a thing wrong with a little fun, and if you’re a wee bairn of three, or four, or five, that means play. 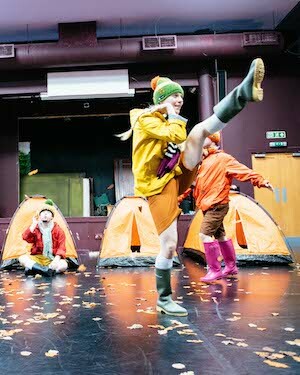 The games that kids play are the stuff of Indepen-dance’s ‘Four Go Wild in Wellies’ (pictured in 2016). And the games that kids play are the stuff of the Scottish dance company Indepen-dance’s Four Go Wild in Wellies, a tiny drop of colour that brightens up the Awesome Festival for little ‘uns and those who dote on them. Wellies is simplicity itself. Four orange one-person tents disgorge four kids (played by adults Hayley Earlam, Emma Smith, Neil Price and Adam Sloan in yellow, red, green and orange). They play games, or variations of games, every child knows. Tag, statues, hide and seek. They get tired and go back to their tents. Lights out. That’s not all there is to it, though. As we watch them play we see those traits that kids learn and begin to master as they play. Aggression and co-operation. Teasing and sympathy. Enmity and forgiveness. All those small lessons in life, those human strengths and weaknesses, that help define us. For all its modesty, Wellies is neatly constructed (by director Anna Newell and choreographer Stevie Prikett) and sounds and looks just fine (set and costumes by Brian Hartley, music – a sweet continuing tune on, I suspect, the electronic forms of banjos, mandolins, accordions, balalaikas, bass and drums, composed by David Goodall). Earlam and Smith are lithe, energetic dancers, and Price and Sloan, both of whom have Down Syndrome, perform with zest and humour. 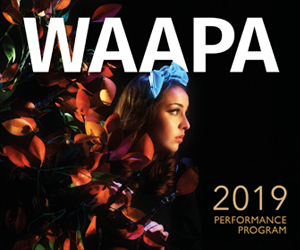 It’s worth noting that we are seeing more and more productions featuring people with Down Syndrome – Julia Hales’ Perth Festival hit You Know We Belong Together (making a welcome return in Black Swan’s 2019 season) and Back to Back Theatre’s Lady Eats Apple at the 2017 Festival are two outstanding recent examples. This recent growth in opportunities for people with Down Syndrome to create and perform is due, in part, to vastly improved opportunities, more generally, for those with Down Syndrome – thanks to a combination of social advances and a significant increase in life expectancy. It’s a wonderful thing to witness in Wellies. Four Go Wild in Wellies plays the PICA Performance Space until October 6.